In addition to the ability to acquire nearly 40 different homes across the game world, players will also be able to buy or craft more than 2,000 furniture and décor items using their existing crafting skills and place those items anywhere in their new homes to make each property truly unique. Homestead is expected to release in February 2017 as a free update for all players of The Elder Scrolls Online on PC, Mac, Xbox One and PlayStation 4. Homestead is a major new update for The Elder Scrolls Online which allows players to acquire and customize their own piece of Tamriel real estate. With tons of homes to choose from as well as thousands of decorating and furniture options to make each home truly unique, Homestead will allow players to make Tamriel their own… and then invite friends over to hang out in their new digs. WHAT HOMES WILL BE AVAILABLE? When Homestead launches in early 2017, players will be able to choose from nearly 40 unique dwellings, which vary from small living spaces, like a room in an Inn, to huge manor estates with vast outdoor areas. Each home will be styled after one of the game’s 10 playable races, but each player can own any home, from any race. At launch, all homes are located in base zones – not in DLC zones -- making it easy for all players to find, buy, and visit these locations from anywhere in the world. Players are able to own multiple homes (but not multiples of the same home) and these dwellings will be account-based, so all characters on an individual’s account will have access to a home once acquired. Players will be able to personalize their homes by crafting or buying furniture and decorations and then placing those items using the game’s new Housing Editor. Players will have the freedom to place items wherever they see fit, to make their new homes truly unique from their friends’ houses. More than 2,000 items will be available at launch for players to use customizing their new homes. This includes furniture such as tables, chairs, chests, beds, bars, counters as well as decorating items like books, food, barrels, paintings, light fixtures, plants, trees, and more. Experienced players who have collected trophies from the final bosses in Dungeons, Trials, and Arenas will be able to display those special busts in their homes to show off their experiences conquering Tamriel’s most difficult challenges. Players will also have the option of placing pets, mounts, and useful functional items in your homes, including Assistants, Crafting Stations, working light fixtures, and even Target Skeletons (with which players can practice combat and builds). Decorating items can be crafted by players using their existing trade skills, purchased using Gold from vendors spread throughout Tamriel, or bought on the Crown Store with Crowns. Most decoration items will be available both in the Crown Store and via in-game vendors for Gold. HOW DO YOU GET HOMESTEAD? Homestead is open to all players and anyone who wants a home will be able to acquire one for free through an initial tutorial quest. Requirements for purchasing most additional homes for Gold include completing the tutorial quest as well as unlocking specific achievements within the zone where they wish to acquire a home. Some of these achievements already exist, and many players will have already completed them. 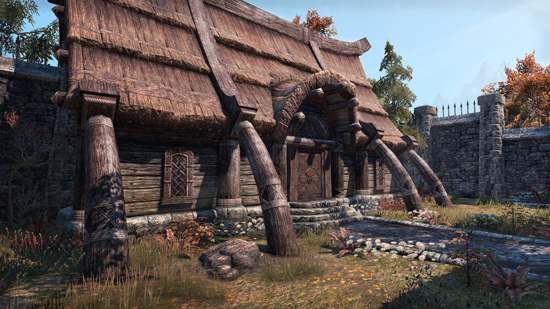 Nearly all additional homes will be available for purchase in the game either with Crowns through the Crown Store or via vendors for in-game Gold. There will be some property that is Crown Store-exclusive, including an ultra-luxurious island retreat. Unfurnished homes will be available for purchase with either in-game Gold or with Crowns in the Crown Store. Fully furnished homes will be available for purchase through the Crown Store with Crowns. Players will be allowed to preview homes prior to purchase, whether furnished and unfurnished. · Players can invite visitors to join them in their new homes. Homeowners can invite players to their home by grouping up, enter their home, and have the group jump to them. Players will also be able to jump to a home via the friends list or guild roster, if the homeowner has those permissions set and is a friend or guild mate. · Homes are secure! Other players are not able to break into homes and steal items. Sorry Thieves Guild!